What are those colorful rings around the Moon? A corona. 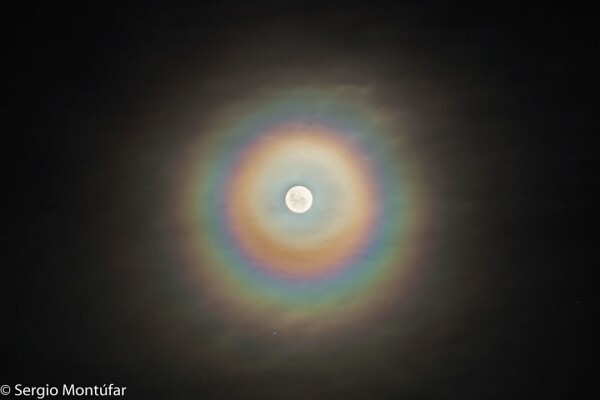 Rings like this will sometimes appear when the Moon is seen through thin clouds. The effect is created by the quantum mechanical diffraction of light around individual, similarly-sized water droplets in an intervening but mostly-transparent cloud. Since light of different colors has different wavelengths, each color diffracts differently. Lunar Coronae are one of the few quantum mechanical color effects that can be easily seen with the unaided eye. The featured lunar corona was captured around a Strawberry Moon on June 2 from La Plata, Argentina. Similar coronae that form around the Sun are typically harder to see because of the Sun’s great brightness.